For years and years, maybe even as far back as the late 90s, I always wanted to make a Game Genie code that would make enemies drop items 100% of the time. I always pushed it off for another day… until yesterday, when I was like, “You know, I think I’ll come up with that code today.” It took a few hours since I didn’t know what I was doing, but in the end I got it! This code doesn’t seem to work with the insta-wins, it only works when you actually get into battle. I guess the instant win stuff uses its own separate programming for item drops. Also, the game programmers designed it so you’ll only win one item at the end of a battle, so if you have a group of enemies you’ll only get one item from them. As a crazy programmer guy I still secretly hope to find a way to turn the above codes into just one Game Genie code, but I dunno how possible that’ll be. Anyway, now if you’re ever frustrated from trying to get certain items from enemies, you have this new code to tempt you to the dark side! Mwahaha! See, i would be tempted to use this code to get the sword of Kings…but part of the good thing about that is the level grinding. but i wonder if someone has created a patch that does this ? it is so powerful but so evil. Can someone provide a framework for translating Game Genie codes into Pro Action Replay? I know that the genie does ROM changes which is a different beast from the action replay’s RAM altering, but I seem to recall some method of conversion. The biggest annoyance with the Game Genie was that while it used HEX code just like the Action Replay, it “disguised” the HEX with letter combinations so it would “look more like magic words”. How does one simply make a Game Genie code? Side-Note: This was a dastardly thing to do, Tomato. I personally enjoy a good challenge. 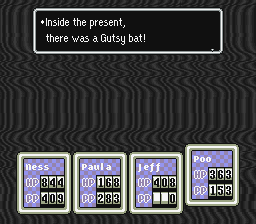 Last play through, I got the gutsy bat and the other ultimate weapons/ armor. I can see why this would be helpful because the gutsy bat took a week of playing each night and about 10 hours of grinding. Honestly, since I have horrible luck in RPGs when it comes to trying under-leveled plays, I don’t think I’ll ever use this. I take the option of getting a rare item to be good encouragement to grind. Otherwise I’d get too tired to grind, and proceed to die alot. I’ve farmed the Sword of Kings four times. That is enough times for me. I have no qualms about using this code to expedite matters — well, except that I can’t plug the Game Genie into the Wii U for when the Virtual Console Earthbound comes out, and that’s likely to be the next time I play it. Alas! DJMankiewicz: There are a bunch of simple utilities one can use for that purpose, of which this is probably the simplest: http://www.gamewinners.com/device/misc/blgg2par.htm . What I don’t get is if someone is willing to use this code to get the rare items, why not just use a code to put them in your inventory? O_o You’re already cheating. I think this is a bit bad idea in my opinion see you don’t earn the item I mean sure its great to get rare items but, still I rather earn my items you get exited when you find a item after working ard then you are kinda proud of yourself I guess. Jason: This was you can’t, say, get the Sword of Kings at the beginning of the game, only when you’d normally get it. It’s not nearly as game-breaking. I’m still amazed I got the Sword Of Kings my first play-through. 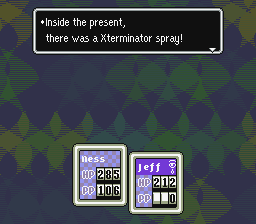 I had no knowledge of the game prior to going in, so when an enemy dropped it, I was like, “Oh, cool, a new weapon.” I got it during my second or third battle with the respective enemy. Later on, I come on here and find out that some people have never gotten it in their whole lives. Ah yes, luck. I have gotten 1/128 items from enemies when I didn’t need them (Attack Slug and Smilin’ Sphere for example, although the extra damage and $1000 is neat). It seems that when you don’t need something, you get it. When you want it, you don’t get it. It can be done in one code. Hooray! I was hoping a super smart guy like you would figure it out 😀 I’m still no good at this SNES recoding stuff. Darien, I appreciate the link. It is good to know such programs exist. Unfortunately, this is one coded for DOS. I’m using Windows 7 64 bit, which means that all DOS support is completely gone. 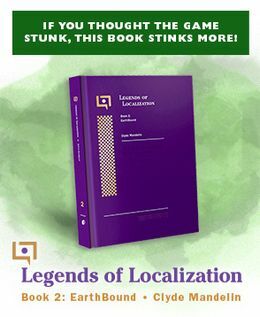 I may try running it in DOSBOX though. I’ll check on this later. The reason I never bothered with either a Genesis or SNES Game Genie is because both have rather fatal design flaws. The Genesis Genie isn’t properly coded for battery backed games, and thus will wipe out save data in any game it is used with. That’s a non-starter right there. The SNES Game Genie is better, but has a critical flaw when it comes to SNES addon chips. It lacks the pins needed to “pass through” addon chip pins to the SNES. Games like Star Fox will thus lack critical hardware and won’t play correctly, or at all. Earthbound doesn’t use additional chips so it shouldn’t have an issue with this. I don’t know if later revisions of either Genie fixed these issues, but as it stands I was fine just importing a Pro Action Replay and sticking with that. (The earliest SNES Pro Action Replay actually suffered the same design flaw, but this was resolved in later revisions. I have the third revision, which even has a feature allowing one to bypass region locking, both software and hardware based. I use it to play Terranigma on my US SNES at NTSC video mode (and original speed, as PAL mode actually slows the game down a bit unless they specifically recode the game to play at the proper speed, which in Terranigma’s case, they did not). I just found a guide which claims to show how to convert a SNES Game Genie code into a fully translated HEX value, which SHOULD be usable on a Pro Action Replay. I will experiment on this later on today and come back with the results. The address is now also decoded. The decoded form is AAAAAA:VV. I’m struggling with how the “bitwise transposition cypher” is intended to be decoded. So running the program (fortunately the page I found also had a win32 version of the application), I get these two pure HEX versions of the codes. The first number is the address and the second number is the value. I’ll attempt to get these working in my Pro Action Replay later on. Mr. Tomato, you are the mack daddy. Nitrodon, you… are my number one… guuyyyy!!!!! They both work! I tested it with a new file and ended up with a full inventory of cookies in short order. These are the pure hex codes and they can be input directly into the Pro Action Replay. The colon can be left out and in fact can’t be input anyway, so ignore that. One caveat: A pro action replay appears to somehow interfere with battle text timing (regardless of any code inputs), so there will be visual artifacts every time dialog changes during battle. This does not appear to have any lasting gameplay effects, so if one wants to cheat, just use the code, get the item, save, then stick the game in without the pro action replay and you should be fine. One caveat: A pro action replay appears to somehow interfere with battle text timing (regardless of any code inputs), so there will be visual artifacts every time dialog changes during battle. This does not appear to have any lasting gameplay effects, so if one wants to cheat, just use the code, get the item, save, then switch the pro action replay’s codes to “off” mode (or remove the pro action replay entirely), and you’ll be fine. Strange, I could’ve sworn I was able to load King Colossus with a Game Genie with the previous save data intact (which I have to do because Japanese Mega Drive carts won’t fit normally in a Genesis, and GG is a lot cheaper than other convertors). Also, I thought that only RAM-altering PAR codes (those starting with 7E or 7F) would work on a real SNES PAR? KingMike, it appears that at the very least, the third revision of the Pro Action Replay can alter other addresses. I know I could easily change the 7E to C2 and it worked, so I suppose that means that it can alter both RAM and ROM. That’s good to know. I also found out all the work I did was kinda silly in the end. The Mark 3 Pro Action Replay has a “conv” button in the code menu that actually converts SNES Game Genie codes into their true HEX value, and the result is the same code I ended up with above. I wasn’t aware that the “conv” button did this until I read the manual. At any rate, the above codes work just fine. If you’ve been able to load a save data based Genesis game with a Genesis Game Genie, that’s good information to have. Either my information was incorrect, or there was a revision on the Game Genie to fix that issue. YES! I CAN FINALLY GET ALL THE ULTIMATE WEAPONS! Yup, I managed to max out all my characters a LOT when playing to get these ultimate items. I like “always drop treasure” codes, although I have a feeling that my inventory will max out really quickly if I use these codes! Sometimes I see these weird responses that are just quotes of someone else’s post with no extra content. They really confuse me. I’ve been wanting a code like this for over 10 years… Thanks!